Your tools to radiant skin, optimum weight & vibrant health! THANK YOU to all who have purchased pHresh Products! Because of YOU....Lynnette and her staff are helping the mission of Phresh Products with the Gift of Life International. Lynnette has helped thousands to gain control of their health, as well as helped them to reverse ailments & diseases. Now, she has become involved with an amazing team to help save children's lives! As a mother of 3 children of her own and foster parent to abused and neglected children, this mission is near and dear to Lynnette's heart. Having faced 2 near death experiences and 27 surgeries with her own son, Coty, it is no wonder this Gift of Life aligns perfectly with her labor of love mission. What an amazing feeling of giving HOPE for LIFE! Lynnette's favorite saying from her 'Grandma Ruby' is: "Where there is LIFE there is always HOPE"! Just think about the power YOU have in your hands right now. Just as you are purchasing these products to gain optimum health, you are indeed helping to give the chance of life to a little heart who may not otherwise had the opportunity to have a beating chance! Imagine the joy being brought to a family in need when a mission effort is set forth to tell the family, "We are going to get your child proper health care to give him/her the HOPE of living life to his/her fullest"! Well, guess what??? YOU have done just that. By purchasing any product from Phresh Products, portions of each purchase from you go to the Gift of Life International. Please read more below and visit web site. Another great way YOU can help save a life. Give the gift that keeps on giving...order Fuel for the Body book. Click picture for complete details. CHANGE YOUR HEALTH... & SAVE A LIFE! Organic Guru Lynnette Marie- Ambassador of America's Outstanding Mom with Celtic Sea Salt staff, Stephanie and Celeste showing their support of this life saving mission! Little Jaime from El Salvador. We LOVE you! At pHresh Products™, our partnership with Gift of Life International, Inc. is something that we take great pride in being a part of. The mission of Gift of Life International is to promote world peace and understanding through the facilitation of free medical services for those in need; primarily children suffering from heart defects, regardless of race, color, creed, gender or national origin. We are both honored and excited to be a part of such an amazing collaborative effort in providing lifesaving heart surgeries and giving a second chance at life while improving the health of families around the globe through our products, helping people to live healthy and active lives. 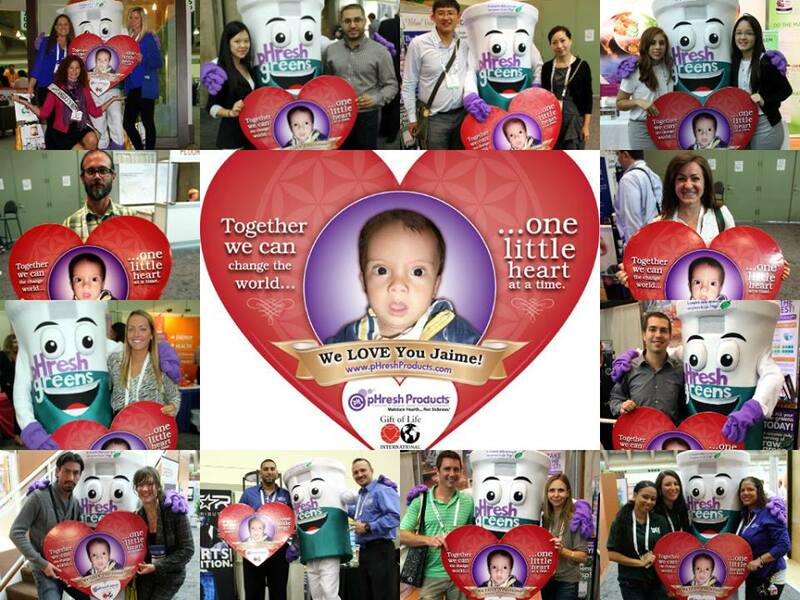 Gift of Life International has saved the lives of more than 15,000 children in 70 countries around the Globe! YOU CAN HELP SAVE JAIME’S LIFE! pHresh Products™ is proud of its collaborative effort with the Gift of Life International to provide life saving heart surgery to children in need while bringing good health to families around the world with our products. 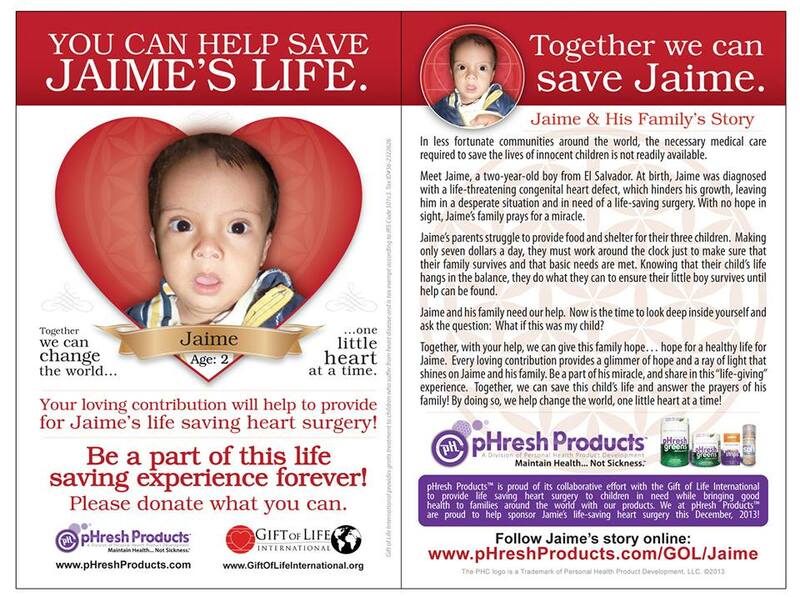 We at pHresh Products™ are proud to help sponsor Jamie’s life-saving heart surgery this December, 2013! Join the many who are saving Jaime! The POWER of working TOGETHER! Be a part of this life saving experience forever! THANK YOU FOR BEING A PART OF THIS LIFE SAVING JOURNEY! YAY! 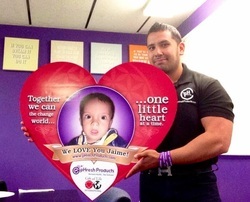 Because of YOU...little Jaime is on a road to LIFE! YOU helped make a difference in this little boy's life and his family. By purchasing PHresh Products , THIS was possible!!! Thank you! and I am super honored to be a 'Phresh Super Star" for this great company! Thank You again EVERYONE! We just wanted to express our appreciation for your generosity in support of Jaime’s life saving mission. Your personal commitment to your own health; was incredibly helpful and allowed us to reach our goal to answer his parents prayers and gave us the ability to save Jaime. Your support in us means so much, but even more to Jaime and his family. Thank you from all of us. We also want to extend this offer to your friends and family! We are currently looking to answer another family’s prayers and save another life. Thank you for joining with us on our mission to help save the lives of children in need all over the world, one little heart at a time. Please also visit our RECIPES section on here to see many ways to incorporate YOUR PHresh Greens into almost any dessert or entree for amazing goodies for the entire family!